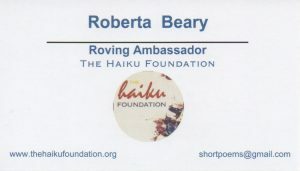 Roberta Beary, The Haiku Foundation’s roving ambassador, currently stationed in Ireland, is available for haiku-related events in Denmark, Sweden and Norway throughout August. You can reach her by using The Haiku Foundation’s contact form. Ms. Beary will fulfill the role throughout 2017. Happy to travel by train within those three countries to meet up with haiku poets. Willing to do workshops, readings, etc. on behalf of THF, talk about THF mission, and encourage haiku poets to make use of THF’s resources. Thank yiu Charlotte. I miss you but lucky for me get to keep up with you and your amazing haiku posts on twitter and facebook! Looking forward to meeting haiku poets in Norway, Sweden and Denmark! I have heard from haiku poets in Denmark and Sweden and we are making arrangements to get together.